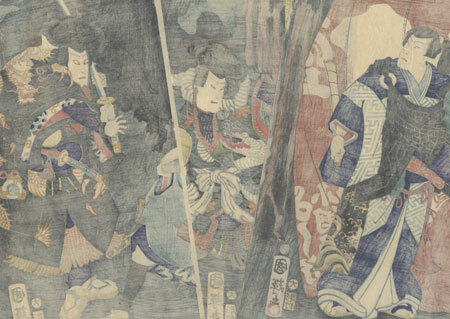 Comments - Intriguing kabuki scene of two samurai attacking a messenger on a road in front of a cave at night. Falling on one knee, the man looks up with a suspicious frown, lifting his hat for a better view of the rogue at right. 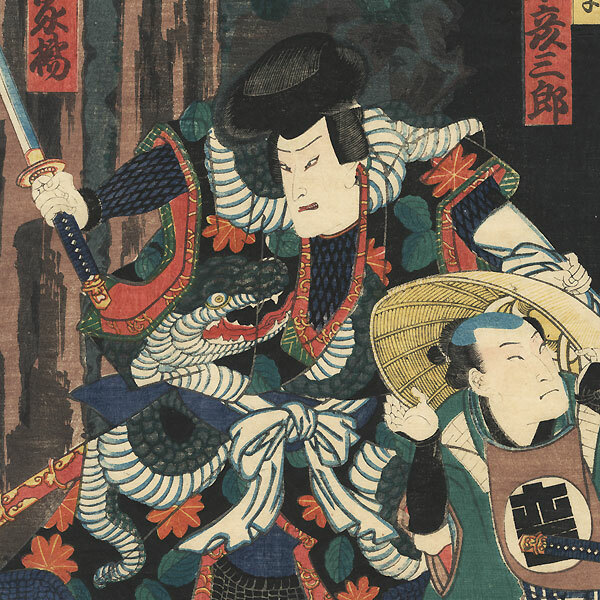 He carries his sword upright, and wears a fantastic black kimono with a burnished plaid pattern and a fierce dragon. The warrior in the center brandishes his weapon, his snake print robe trimmed with fringe that swings as he moves. A komuso or wandering monk stands beside a billowing curtain at left, watching the confrontation with a stern expression, his shakuhachi flute in hand. Tree trunks frame the rocky entrance to the darkness of the cave. A fascinating subject with an atmospheric setting, beautifully detailed. Condition - This print with excellent color and detail as shown. Three separate panels. A few small holes, slight thinning at edge, repaired. Slight soiling and creasing. Please see photos for details. Good overall.